Give studio cycling a try. 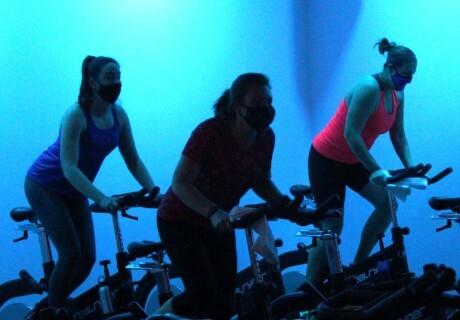 Train like an athlete in one of our interval classes. Lengthen and align through Pilates. Get stronger by attending a strength training session. Create balance with yoga. Splash into our aquatic options or shake it in our dance classes. Exercising with others is motivating and fun! 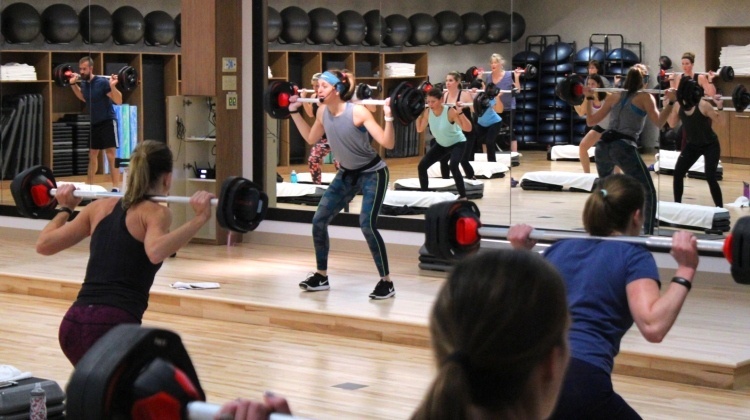 We have five group fitness studios, including: two main studios, one Cycle Studio, and two studios for our Mind Body classes. With more than 100 classes offered weekly, enjoy our dynamic workout options for all fitness levels and interests. To view all class offerings, including times and descriptions, see the Group Fitness Schedule. Members can also view the current Group Fitness schedule through the RAC app. Learn more about the RAC app on the App Guide web page. Enjoy yoga classes in our Mind Body Studio. We have a vibrant program in which different yoga styles and levels from beginning to advanced are offered each week by our certified instructors. Our community of yoga instructors and members love to gather to center, balance, and refresh their minds and bodies. Throughout the year our talented and experienced yoga staff offers specialty workshops to help our members experience new aspects of yoga and improve their practice. Aerial Yoga utilizes a fabric hammock as a tool for balance and suspension allowing you to explore a variety of yoga poses safely, with greater ease and depth. There is less pressure on hands, neck and shoulders. It’s safe and fun. Feel grounded as you fly! Kids ages 7-12 learn yoga poses while building community, connection, and teamwork. Our Pilates Studio is a great place to learn and experience the lifelong benefits of applying Pilates exercise principles to your life. Let our experienced Pilates instructors work with you to improve your core strength, postural alignment, flexibility, and ease of movement. Feel the Pilates difference. Enjoy the way your body and mind feels after one of our classes. In addition to the free Pilates based classes on our Group Fitness Schedule, we also offer an extensive multi-level apparatus class program (Reformer/Tower or Pilates Chair) and Pilates Private Instruction. See the Schedule of Activities for more information about our Yoga and Pilates offerings. Our Cycling Studio is available to members anytime of the day. Our Real Ryder bikes are more than just your average stationary bike as they allow you to steer, lean and balance as you ride. Hop on a Real Ryder bike and try a group fitness cycling class or use the studio for your own workout when classes are not in session. They are a great core strengthening, low impact cardiovascular workout.